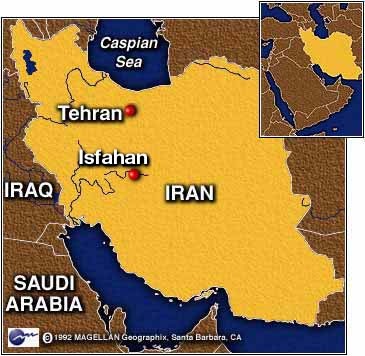 TEHRAN, Iran (CNN) -- The last total eclipse of the sun of the 20th century was another opportunity to improve cultural exchanges between the United States and Iran. Alan Hale, one of the discovers of the Hale-Bopp comet, was invited to view the event on a mountaintop near the ancient northern city of Isfahan. "Our reception has been overwhelming. The Iranian people have been extremely warm," said Hale, an amateur astronomer. Both Washington and Tehran have undergone a hesitant, slow- moving diplomatic effort to improve relations since moderate Mohammad Khatami became Iran's president in 1997. The Clinton administration has eased travel to the United States for Iranians and is supporting cultural and academic exchanges. 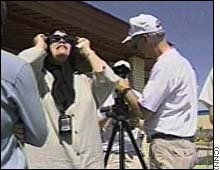 Former Apollo 9 astronaut Russel Schweikart was also in Iran to watch the eclipse. "Its an absolutely beautiful country," he said. "We've met technical people, people on the street. It's a country where you can't help but get into all kinds of conversations and a great deal of fun." 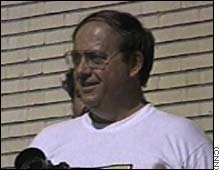 There have been no diplomatic relations between the two countries since April 1980, five months after militant students stormed the U.S. Embassy in Tehran. The coming of age of a new generation of Iranians with little memory of the 1979 Islamic Revolution has given hope for better relations in the future. But Islamic hard-liners -- who control most of the state bureaucracy and court system -- have moved quickly to crush potential threats to their power. Student demonstrations, which began in July to protest the closure of a reformist newspaper, led to the arrest of more than 1,000. Conservative clerics have since organized rival demonstrations in Tehran and other cities. In Isfahan, a group of Islamic vigilantes harassed tourists in town to view the eclipse, the official newspaper Iran reported Thursday. "A group of about 30 Hezbollahis gathered and chanted 'Death to America' and other slogans against the style of dress of the female tourists," it said. The paper, published by the state news agency IRNA, described the vigilantes as "thugs." Reporter Shirzad Bozorgmehr and Reuters contributed to this report.